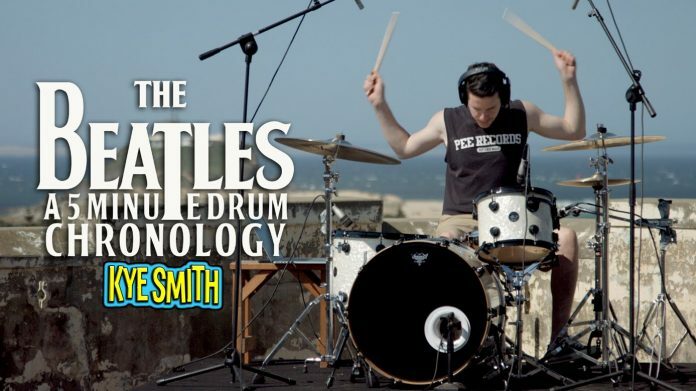 Starting from 1962 and ending at 1995 (don’t forget Free As A Bird, ya know), Kye Smith, a drummer based in Newcastle, Australia, plays the signature parts of all your favourite Beatles songs. Like, all of them. And he did it on top of a building, a nod to the fab four’s final concert on the top of Abbey Road Studios. Way before I found out about punk rock or even knew what a snare drum was I spent my childhood playing vinyl records at my grandparents place spinning artists such as Slim Dusty, ELVIS PRESLEY and The Beatles. This chronology called for some special treatment and got me out of the studio and onto the rooftop of The Great Northern Hotel – Newcastle, Australia for a pretty stunning view of Newcastle, New South Wales in the background. Thanks to everyone at The Great Northern for letting me make some noise up there and to Eluminate for helping me shoot it and lug heaps of gear up 7 storeys of stairs!